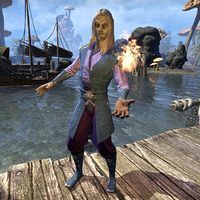 Adept Sendet is a Dunmer member of House Telvanni who can be found at the docks in Sadrith Mora. Adept Velanda : "I'm glad that this town sprung up around Tel Naga. It allows me to study some interesting things." Adept Muvrulea : "Yes. The isolation of the island had made for many hours of uninterrupted study." Adept Sendet : "If only there weren't so many outlanders wandering our streets." Adept Velanda : "Ah, but some of these outlanders can teach us much. Observe them and take note. You'll understand." This page was last modified on 30 January 2019, at 02:13.